Angelfish are a species of cichlid native to the Amazon River basin in Brazil. The angelfish is one of the most easily recognized species of freshwater aquarium fish. Not only are angelfish unique, with their long, pointed fins; they also come in a variety of vibrant colors. 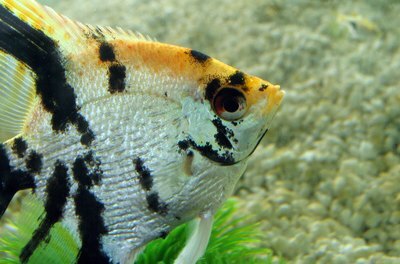 If you are looking for a new fish for your tank, consider the angelfish. Select a tank for your angelfish that is taller than it is wide to accommodate the long, vertical fins of these fish. Because angelfish can grow up to 6 inches, you should keep them in a tank no smaller than 20 gallons in capacity. Line the bottom of your angelfish tank with soft sand or gravel substrate to simulate the natural environment of these fish. Use live plants and large pieces of driftwood for decoration in the tank and to provide your fish with hiding places. Concentrate the live plants in your angelfish tank around the back and sides of the tank. Angelfish prefer densely planted tanks, but the arrangement of those plants should allow for plenty of open swimming space in the center of the tank. Maintain a stable tank temperature between 74 and 84 degrees Fahrenheit with the help of an aquarium heater. You may also want to use an in-tank thermometer to keep an eye on the tank temperature. Keep the pH in your angelfish tank steady between 5.8 and 6.2. Though angelfish may tolerate a greater range in pH, they prefer water that is soft and slightly acidic. Use an aquarium filter that does not produce a strong current. These fish come from an environment where the water flows slowly. Perform frequent water changes to keep the water quality in your angelfish tank high. Because you will not be using a high-power filter, frequent water changes are necessary to keep ammonia levels under control and to keep the water from becoming too hard. Feed your angelfish a balanced diet composed of high-quality cichlid flakes or granules supplemented with live and frozen foods. Offer your angelfish small amounts of food twice daily. Use caution when selecting tank mates for your angelfish because many species will nip at their long, flowing fins. These fish are best kept with other species of similar size and temperament. Test your aquarium water on a weekly basis using an aquarium water test kit. Record the results of these tests in a journal so you will get a feel for what is normal for your tank. You will be more likely to recognize problems with water quality before they escalate out of control. 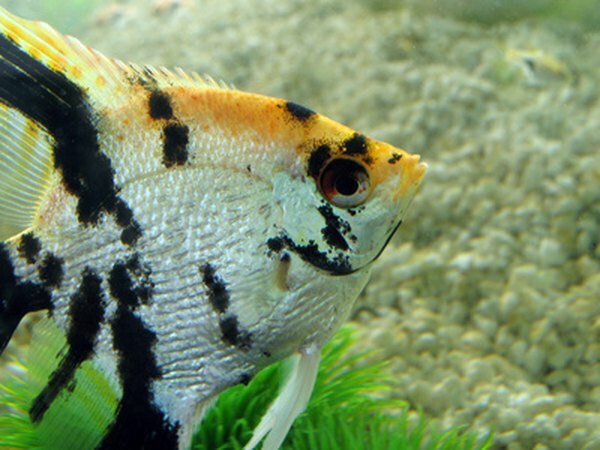 If you do not keep the water quality in your angelfish tank high not only could your fish fail to thrive, but they may also begin refusing to eat.